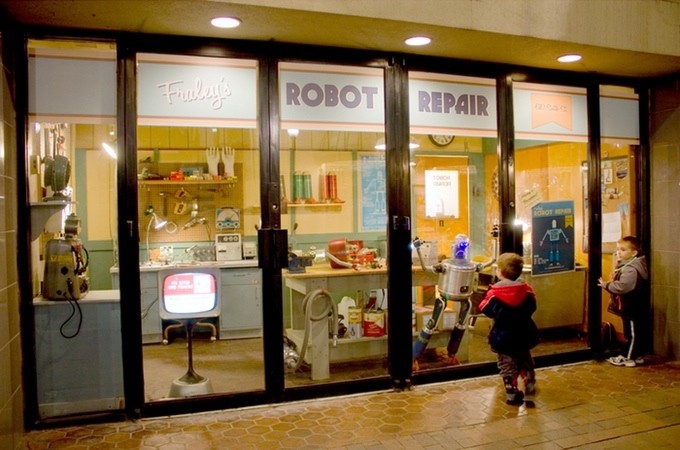 Will Pittsburgh Robotics Network's new partnership grow the city's share of the global market? Fraley's Robot Repair at Pittsburgh International Airport. Photo courtesy of Toby Fraley. Will Pittsburgh Robotics Network’s new partnership grow the city’s share of the global market? Even in a booming field like robotics, and even in a hub of research and activity like Pittsburgh, the transition from promising startup to a full-fledged company is a difficult task. For Dowling and his group, which includes more than 50 local robotics companies, infrastructure refers more to people than roads. Though Pittsburgh is rich with coders and engineers, creating a local robotics sector that can sustain itself into the future and grow the local economy will require help from many non-technical professions that are currently in short supply, such as marketing gurus, legal experts and HR managers. To help fill the gaps, the PRN has formed a new strategic partnership with the Robotics Industries Association (RIA), a national consortium dedicated to promoting robotic development in service and manufacturing. Announced on Feb. 1, the partnership will put the city’s existing robotics firms in regular contact with the more than 550 members of the RIA, a roster that includes dozens of companies, universities and researchers across the nation. Speaking to NEXTpittsburgh, Dowling said the partnership will be critical in the network’s efforts to attract and retain talent and turn their burgeoning sector into a pillar of the local economy. The RIA brings “another level of interaction with the community outside of Pittsburgh,” said Dowling, who in addition to his role at PRN is also CEO of the 3D mapping firm Kaarta, based in North Oakland. According to an analysis from Berkshire Hathaway, the market size of the global robotics industry was roughly $32 billion in 2017, and is expected to grow to $77 billion by 2022, as smart appliances proliferate in homes. If Pittsburgh is able to capture even a small amount of that market, Dowling says the resulting wealth and economic activity — if properly managed — could bring new populations and prosperity to the region.